To shred beet, insert each hand in plastic sandwich bag to avoid staining hands. Peel beet using swivel blade vegetable peeler. Using coarse side of box grater, shred beet to get 3/4 cup. Save remaining beet for another use. 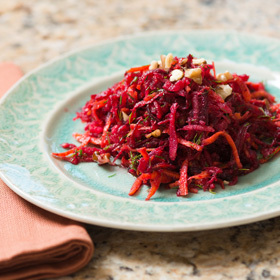 Place shredded beets, carrots and apple in mixing bowl, and mix to combine. Add walnuts and green herbs on top of mixed vegetables, and set bowl aside. For dressing, in small bowl whisk together lemon juice and salt until salt dissolves. Add 3 to 4 grinds of pepper. Whisk in oil. Pour dressing over salad and mix until well-combined and evenly dressed. Serve salad within 1 hour of combining with herbs and dressing. Serving size: 1/4 of recipe. Amount per serving: 112 calories, 8g total fat (less than 1g saturated fat), 11g carbohydrates, 2g protein, 2g dietary fiber, 330mg sodium.